Iran's Transportation Minister on Sunday said his country is considering reopening direct flights to the US - the same day that Iranian Supreme Leader Ayatollah Ali Khamenei posted photos on his Twitter account gloating over the recent capture of US sailors. Two weeks ago on Wednesday Iran released ten US sailors it had captured the day before after they strayed into Iranian waters due to a technical malfunction; Iranian generals later revealed Tehran had missiles locked on American warships ready to blow them out of the water during the standoff. 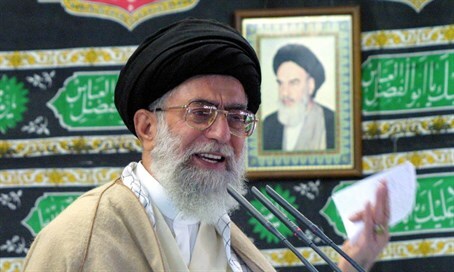 Khamenei posted pictures on early Sunday morning to his Twitter, detailing how he met with the Islamic Revolutionary Guard Corps (IRGC) members who had captured the sailors so as to gloat over the incident. "What you did was very great, interesting and timely and it was in fact God's deed that took Americans to our waters so that through your timely job they raised their hands over their heads and were arrested," Khamenei wrote in a poorly translated rendering of the message he had for the captors. Khamenei also posted photos of his meeting with the IRGC forces, which included pictures of them praying together. Making the hostile postings all the more ironic is the fact that they came just hours before Iranian Transportation Minister Abbas Akhoundi announced Iran may try to resume direct flights to the US, reports the semi-official Fars News Agency. The minister told reporters that the Iran Civil Aviation Organization (ICAO) is considering the move, now that the controversial nuclear deal went into effect last Sunday; US Secretary of State John Kerry last Thursday admitted part of the massive sanctions relief windfall will go to terror. Akhoundi added that ICAO is looking to buy 114 commercial jet airliners from Airbus, further showing how the kickback from the lifting of the nuclear sanctions is aiding the leading state sponsor of terror. ICAO Chairman Ali Abedzadeh said Iran will need at least 500 commercial aircraft in order to expand, and hopes to buy a total of 150 new commercial jets in the short term to reach international standards. Tensions between Iran and the US have been running high despite the implementation of the nuclear deal. The US last Sunday imposed new sanctions on Iran's ballistic missile program over Iranian breaches in recent missile tests, and in response Tehran vowed to defy the sanctions. Concerns have also been raised over a transfer of $1.7 billion in US taxpayer funds to Iran last Sunday coinciding with a prisoner swap and the nuclear deal implementation. From the statements of Iranian officials it appears the transfer, which was for a cancelled military deal from the late 1970s, was a ransom payment.